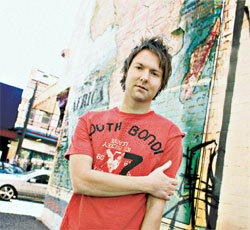 "Reuben Morgan has a passion to see the church and the world inspired to worship God." That's what it says on the man's Web site, and it's a phrase that couldn't be more authentic. The awesome magnitude of inspiring and unleashing true worship is a daunting challenge, but for Australian Reuben Morgan, it's a challenge he's more than prepared to meet. World Through Your Eyes is the Hillsong Church worship leader's first solo album, a surprise considering his impact on churches worldwide as a writer. Morgan currently has songs on the Top 25 Worship songs chart (survey by CCLI) in six different countries, while in the U.S. he has 17 songs in the Top 500, more than any other writer. Having been the heart, the prayer and the pen behind such 21st century classics as "Lord I Give You My Heart," "My Redeemer Lives" and "Hear Our Praises," Reuben's reputation as a worship leader and songwriter has grown immensely over the last nine years. Working with Darlene Zschech has helped, as has taking a leading role in the creation of the hit-factory known as Hillsong United. But the truth about Reuben's appetite for inspiring the generations to worship the Creator is found in the man's songs. Take a trip through World Through Your Eyes, and you receive a gentle battering from cascade melodies, surf's-up guitars and choruses with a genetically-enhanced half-life. "Gloria," for example, takes off like Latin never took off before, soaring with the euphoria of eternal praise. The title track adds elements of American flavoured harmonies, British guitars and universal praise. Other standout tracks include the mighty "The Fear," the epic "Waiting Here" and the utterly determined "Stand." As we've come to expect from Hillsong, Reuben's songs capture the personal just as well as the eternal, lining up passionate commitment with heart-fuelling melodies. It's clear that such songs have already made their mark on the church. Hillsong's Sydney-based congregation tops 18,000 while global connections have seen Reuben's songs spread across continents, receiving cover treatments from the likes of Michael W Smith, Rita Springer and Robin Mark. As for the world at large, well he's certainly on track. With premium production and a knack for hitting emotional nerves with lyrics and melodies, Reuben's vision looks as solid as it is bold. Most importantly, the heart behind the words serves his songs and the congregations that sing them with a genuine, fervent purpose. "My music comes out of a burden to see people connect with God," Morgan says. "I believe music was created to reflect the glory of God and to draw people into a deeper knowledge of Him... and that is my pursuit."